Prof Michael Pankratz and his research group at the LIMES (Life and Medical Sciences) institute study the molecular mechanisms underlying brain physiology and behavior. To understand these complex circuits they make use of the fruit fly, Drosophila melanogaster, as a model organism. Shedding light on how the immune system is linked with behavior, Prof Pankratz explains us why Drosophila is a suited model to study this connection. Michael, you are working on brain function and feeding behavior. Some years ago, you became interested in how behavior could be linked with the immune system. Can you tell us how you came up with the idea to study this connection? Right from the very beginning I was involved in building up the ImmunoSensation Cluster. Studying the immune system as a sensory system we also wanted to include neuronal aspects. When we discussed that connection, Veit Hornung, one of the other members, told me about Medzhitov a very well-known immunologist. In an interview he was asked to name the big mysteries in immunology to be solved in future. Apart from understanding fever the other big open question would be how the immune system affects behavior, he replied. For me, that actually was the first moment when I realized a very obvious thing: If you get sick, you change your behavior (you have less appetite, move less…)! 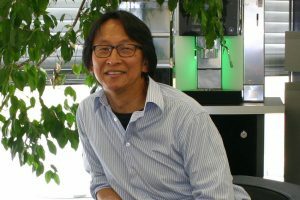 When asked next, what he would work on now if he was a young PhD student again, he answered that he would love to solve the latter question. Now, several of your students are working on that question. How did the start into a topic no one had really worked on before go without established tools at hand? Initially, studying these aspects was intended as a small side project. As a supervisor you don´t want to give your students a project you are not certain about whether something will come out of it – you want your students to succeed in their work. Nevertheless, I had a student who was very excited about the idea to study the influence of the immune system on behavior. One of the first experiments he started was to track the behavior of Drosophila larvae when their food was contaminated with bacteria. And indeed, the larvae turned away from the food containing bacteria! These initial experiments were very exciting for us. In our lab no one had ever done an experiment with bacteria, before. So far, we had studied how the brain controls behavior. Now, we also were wondering how the immune system controls behavior. Next, when dissecting Drosophila larvae a student realized that taste receptors can also be found the larval gut. In principle, taste reflects information that is transmitted to the brain when sensing certain chemicals. Apparently, the same receptors, which have evolved to transfer taste information, were present in the gut to detect chemicals. It is likely, that first chemosensation receptors were present in the gut for defense mechanisms and to control homeostasis, and then evolved to serve for further sensory functions in outer organs. In the adult flies you also find „taste“ receptors on their tarsi, the tips of their legs. It´s like they walk on bananas and taste with their feet. So, for us the question was: What do these receptors do in the larval gut? Do they transmit a “taste” information and what structures do they detect? When we added bacteria on the gut’s chemosensory cells we found that the cells became activated. Thus, my grad student wondered which bacterial structures were sensed by the intestinal receptors and this has now become a very exciting issue! In former times, Drosophila served to identify the functions of a large number of genes. Actually it has been the fly in which an important innate immune component, the receptors to recognize foreign patterns, were identified first. Going beyond Toll receptors: Why is Drosophila a well-suited model to study the influence of immune defense mechanisms on neuronal sensing? It is the simplicity of the organism that allows one to study complex systems. The immune system, the microbiome with secreted chemicals that it produces, as well as the brain are probably THE three most complex biological systems within organisms. When you ask about the interactions of such complex systems, a model system with less complexity is extremely helpful. Therefore, the power of Drosophila as a model is its lower degree of complexity which allows you to study more complex systems. For the larval brain, for example, we have a complete electronmicrographic reconstruction and a map of the individual cells’ connectivity is being built up – That´s inconceivable for the human brain. With Drosophila, I think, we can study and understand complex systems. The fruit fly allows getting from studying gene functions to analyzing cellular gene circuits, networks and their connections on a brain-wide level. Your group showed that distinct neurons (the Hugin/Neuromedin U neurons) are connected with insulin producing neurons and influence feeding behavior as well as antimicrobial peptide production. Which further connections and knowledge from these mechanisms might be resolved? The next big frontier will be how the internal state is sensed by the brain and how these signals are transferred to the brain. Outside sensory inputs to the brain (like olfaction, vision or mechanical sensation) are well studied, but about the internal sensing (like infections and microbiome) much less is known. That´s still the BIG unknown. Therefore, questions are: What are the receptors? Which metabolites are sensed? How is this information transferred to the brain? 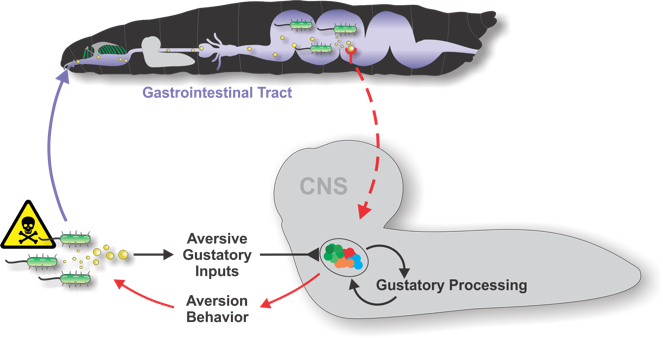 And finally, how does information from the gut change the feeding behavior, i.e. make the larvae stop feeding and move away when bacteria are present? Here, it is a lot about evolution as these are very ancient and conserved processes. How the immune system and behavior are connected is not well studied so far and studying these questions in the mammalian systems is EXTREMELY difficult. We are in a very exciting time to study these connections and as fly researchers we can go ahead to show how these systems are connected. Finally, what´s your advice for PhD students? First, there is one very general thing: Do what is fun for you! But second, looking back to my grad student and postdoc time, my advice is to go to an environment were excitement and a critical mass of other smart people are around. Therefore, you should go to a famous place. Science is a very social thing. Therewith, I mean that it is a lot about interacting with other researchers and to be in an inspiring atmosphere. This environment is extremely critical!